Stockmar went back. Charlotte did not see him. She turned her face, drew up her knees to her chest and fell silent. Stockmar took her cold hand and searched for a pulse. There was none. ‘The flower of Brunswick’ had faded. ‘The Daughter of England’ was dead. ‘Out of spirits & agitated terribly,’ Charlotte described herself, and evidently she appeared so to Miss Knight. Yet to Mercer next day she wrote that she was quite won over by by the Prince of Orange, and was touched by his kindness and anxiety to please her. ‘He was desirous … that those I had about me for ladies should be agreeable to me & friends of mine’, and when he took his leave, ‘it was in the most affectionate manner, all warmth & openness of heart & feeling with me’. Mercer was puzzled by Charlotte’s attitude. She had described herself as ‘delighted’ with the Prince of Orange, and was apparently trying to reconcile herself to the Dutch visits. Why then was she still unhappy? Charlotte told her. She was bitterly hurt by the way in which her father had cheated her. The whole thing, his kindness, his displays of affection, which had made her so happy before her meeting with the Prince of Orange – the whole thing had been a fraud, a careful plan to win her consent to the marriage. It was ‘a trick’, she said angrily, ‘to catch me’. The question of living abroad, she now knew, was to have been kept from her till it was too late to retract. Miss Knight too felt that Charlotte had been tricked into giving her consent. On December 21 she wrote to Mercer Elphinstone, with whom she was now on the best of terms, deploring the ‘manoeuvres’ employed by the Prince to weaken Charlotte’s resistance. The Duke and Duchess of York, said Cornelia, had done a great deal, ‘not appearing in it themselves, but by others’; indeed, from her account, Charlotte must have been surrounded by people hoping to benefit by the match. Miss Knight particularly blamed Lady Anne Smith, the Duchess of York’s lady-in-waiting, and her daughters, Anne and Georgiana Fitzroy, who, she said, ‘have worked most cautiously but unceasingly – and have persuaded the young P[rince] to ask that Georgiana may belong to* Pss Ch’. 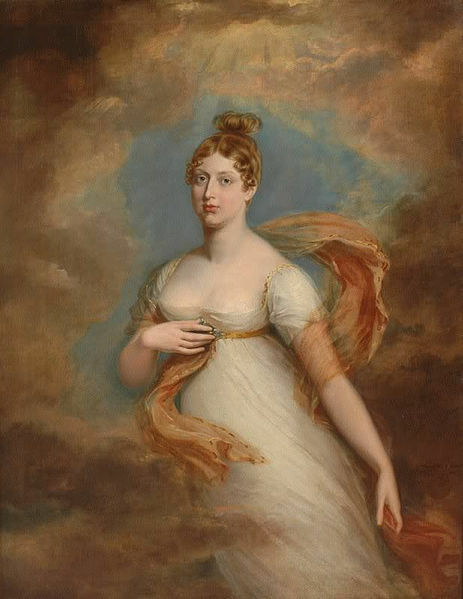 It may be remembered Georgiana Fitzroy, after waltzing with the young Prince at Oatlands, sent Charlotte an account of him, in which she raved about his waltzing but deprecated his plainness and his thinness. Georgiana was the Duke of Wellington’s niece, which no doubt commended her to the Orange prince: and three months later she was trying to make up for the unattractive picture she had given of him by emphasizing to Charlotte what a good figure he had, what good teeth and what good manners. * In other words, be one of her Household, after her marriage.